Brewed and bottled by: Eldridge Pope and Co. Ltd. 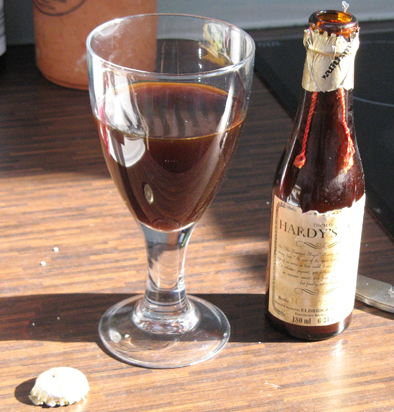 Overall, very similar to other Hardy's Ales I've had, but more so, less fight in it than the younger ones I've had. I don't know if it's improved over a 10 and 12 year old I've had, so it might be worth trying my 2004 brew shortly. 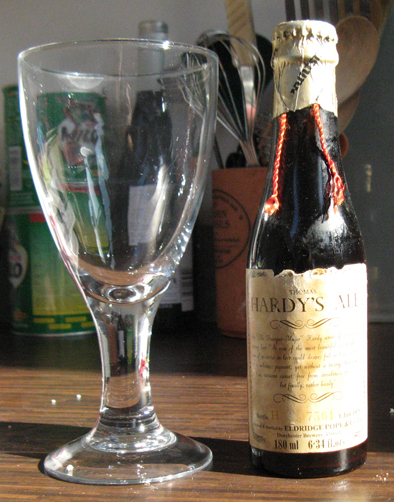 It seemed quite high in alcohol content too. Here's some pictures of the event, apparently that rarity - a sunny day. This blog is not known for its how-to guides, nor its swashbuckling descriptions of Hemingway-esque manliness. The sole attempt consists of booze reviews, and even then, although in some quantity, there is a prerequisite of quality. My man card could be in danger. My plums replaced with raisins. Etc. etc. So when the washing machine died, I stripped down to a loincloth, oiled myself up, and went into battle. I say died, it was more gradual expiration, the spin sounded laboured, then slowly gave up going around in full circles, deciding a range of 270degrees was enough for it, a full 360 was just us being so goddamn unreasonable. Only then did it decide that 270 was too much, and no spinning would be even easier for it. Damn you sirius cybernetics corporation. I found my tools, switched off the machine (I'm not that manly), upended it and promptly would have had entered a wet t-shirt competition - if I hadn't been thoroughly oiled, a displaced kiwi Adonis. Hmm. I guess that'll count as hydrating the raisins. I pulled the filter / drain apart, it was kinda clogged, so cleaned that. I say filter, it's more of a ball at the end of a tube. That's not a euphemism, get your mind out of the gutter, pervert. That didn't fix things either. So I replaced the brushes, yes, that's how old school washing machines are, they use brushes. I figured a £15 outlay to see if it fixed things was reasonable. It turned out to be pretty easy to replace, and they were warn and looking quite soot covered. I was hopeful. Sadly, no zombie washing machine action for me. That meant it had to be the motor itself, which would cost me around £100. A new machine was about £240. Discretion being the better part of valour, we have a new washing machine being delivered next weekend to celebrate the Jubilee. I know, I bet Liz and Phil are doing the same. If you'd told me at the beginning of the year that two of the best concerts I'd go to would be from artists who started in the late 1960s, I'd have called you an idiot. However if you had said that, I'd now owe you an apology. A month ago I saw Jethro Tull/Ian Anderson touring Thick as a Brick 2, which is all sorts of excellent. In fact it's got that highly annoying problem of good Tull albums that it seeps under the skin and you find yourself reaching for it time and time again. Last night I went to see Focus at the Musician in Leicester. I went in only knowing that one track, and was blown away by a masterclass in jazz-rock-metal. Yes I suppose you could call it prog, but I'm not sure that really explains them, there's far more jazz in there than most prog, although the hardrock/metal bits fit well within the prog-metal genre. Led by the hammond organ / flutist Thijs van Leer the band is very tight, and rocks hard. It's quite hard to describe their style, since it's all over the place - without being annoyingly so. Everything seems very organic, the sign of a good band, and the musicianship is great. The guitarist, Menno, in particular, was cranking of disgustingly good solos - and without the histronics of some guitarists - win! I liked the lack of vocals (in a classical sense), made for an interesting change. Really pleased I went, and I they've got a new album out soon - I picked up a live in europe CD, which I was going to link to from their website, but its pretty crap selection. And I can't find it on amazon. Focus are doing a reasonably extensive UK tour at the moment - definitely worth going. Last week I went down to London for the Steven Wilson gig. I'll admit, I love the new album (grace for drowning) but this gig. Bloody hell. Definitely something else. And likely to hit best gig of the year. I also have utmost respect for SW for dumping Porcupine Tree after their most successful album and releasing something completely different and utterly engaging. Even non-prog people are liking this - i've inflicted it on a number of people now and the odd combination of very tune based, jazz, pop, rock seems a winner. My iTunes artwork isn't displaying when I use aMSN. This obviously upsets me, hugely. Lion is a 64bit OS, aMSN (both SVN and standard release) appears to be 32bit. And that's why the two don't play nicely. But there's a quick fix. Close iTunes. Go to the Applications folder, do a Get Info, and select Open in 32-bit mode. This seems to work. Although I've noticed that you need to start aMSN before iTunes - especially if you use a remote storage location (NAS) for your iTunes library. Why, of course my life is exciting. Well ok, two of the three are metal, and the third won a metal award. Are as brutal live as they are on record. I've only got one album, Obzen, but I like it. Very dry, exact, and immensely heavy. Brilliant stuff. I'm pleased I went, but I doubt I'll go again. What really stood out for me were the support band, Animals as Leaders. Think of a heavy version of King Crimson, so heavy take on jazz - 'Red' era KC perhaps? Anyway, I really liked them. No vocals either which made a nice change. It's been ages since I saw Tull, admittedly Tull without most of the band. But really, Tull is Anderson. I went in with quite low expectations, after all he's been performing for years. Although the quality of the new album, Thick as a Brick 2, was a good sign. The gig was a double header of TaaB and TaaB2. Which was brilliant. There's always a good dose of humour at Tull gigs, and although the audience was getting on a bit, they seemed right in to it. I was quite surprised that he'd sold out the Derby Assembly Rooms, but it's a good venue (unless you are buying beer) with excellent sound. Really enjoyed this, likely to be one of my top gigs of the year - and I'd recommend picking up TaaB2 - Tull at their very best. I'm not a huge fan, but they were playing in N'ham, so nice and close. And I do really like a couple of the albums, One Second and Host. This was in the Rescue Rooms, which is a smallish venue, with expensive beer, although they have Harvest Pale on, so it's good beer. I had been warned that live, the band wasn't great. Or rather the lead singer didn't always seem to be into it. This appeared to be the case here. I thought he was mixed a bit far down too, and that didn't change wherever I stood, which didn't help. Good band, and I enjoyed the new stuff, whcih seems to have gone back to their earlier metal roots (compared to one second and host). Probably enough that I'll pick up the new album, at some stage. It's all very doom and goth, but it's good stuff. Some excellent work by the guitarists, but the gig did seem rather short, I counted it as less than 90 mins which for a band with an extensive back catalogue seems a little cheap.